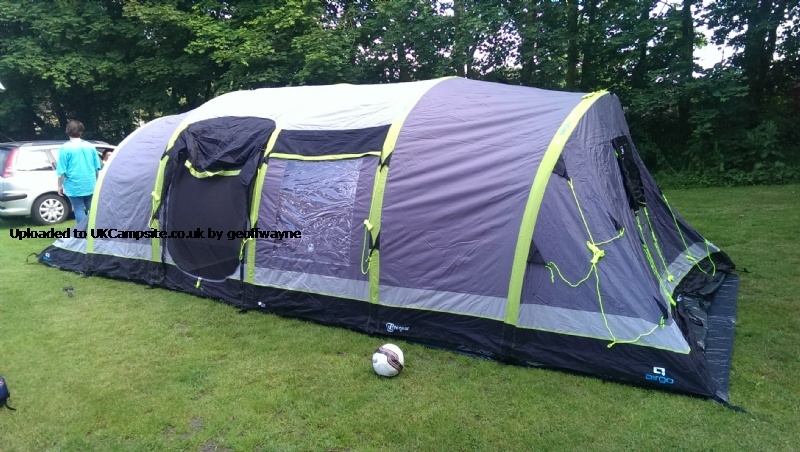 This is my first ever tent and I have to say it is an absolute dream so easy to pitch within minutes. Loads of room inside I went away with my wife and 5 children we all had a fantastic time . 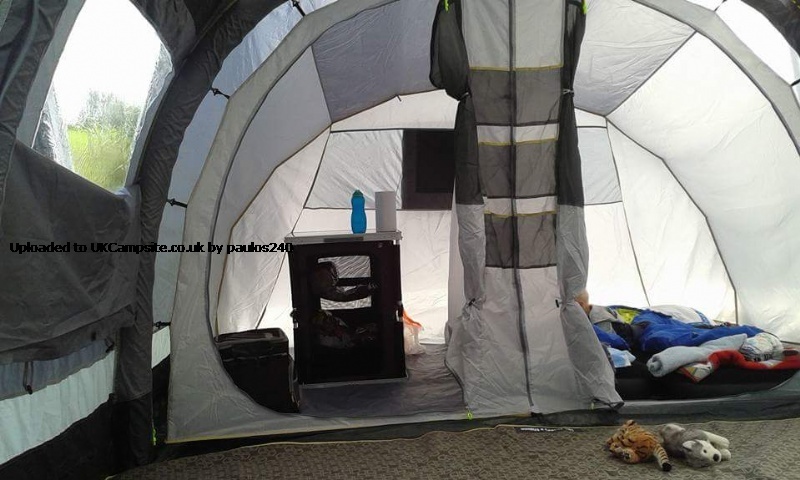 I was torn between this tent and a Vango air tent, so glad I went for this I brought the full package, the foot print, carpet and porch which adds a massive amount of space super easy to put up and super easy to take down.I know that I am a newbie to camping but I have fell in love with it and I don't think I could have picked a better tent, really good ventilation, plenty of storage pockets. This is a peach of a tent cant wait to get back out there in it. We had some heavy rain while we were away and the tent was bomb prof love it. Love our Nimbus 8. Lovely to position and pitch. Spacious, all entrances good and seems quality throughout. We also have the awning which is a great addition. We have camped in hot weather and also much rain and there were no problems. The tent and accessories are big and heavy so maybe a trailer is the best plan. Overall Great tent! We bought this tent as an upgrade and are extremely happy we did. Although the bag for the tent is huge it fits perfectly in my Honda CRV. We bought our tent as a bundle package so got tent, foot print, porch and carpet. The porch footprint was the confusing part and as this was our 1st ever use we left that bit out. A diagram and better instructions would have been helpful. 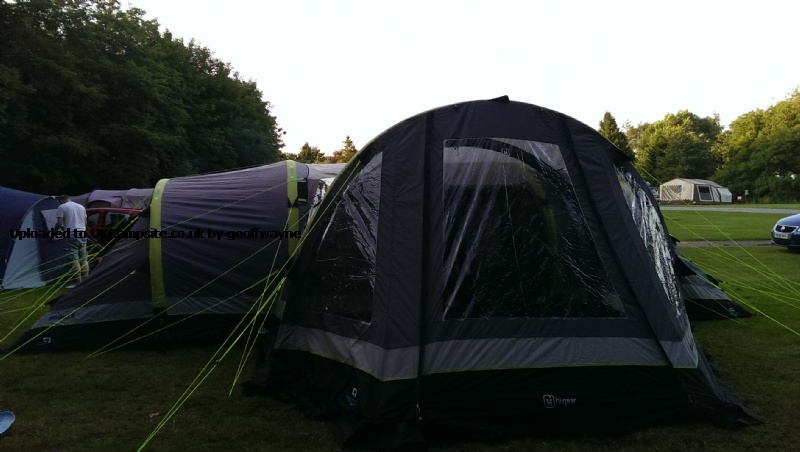 All in all I would definitely recommend this tent, extremely comfortable and plenty of room for our family of 3. Amazingly quick to erect and have access to. Longitudinal and cross beams form a frame that means the tent is up and stable without a single guy in normal conditions within a few minutes. Everything appears good quality and, once fully pegged down, the tent is very stable in windy conditions. Only complaint is the porch, fiddly to get erected centrally and no ventilation meshes whatsoever. This reduces ventilation in the main tent unless you open the porch flap. No porch blinds mean that any gear left in there is visible, very poor for a �300 porch. 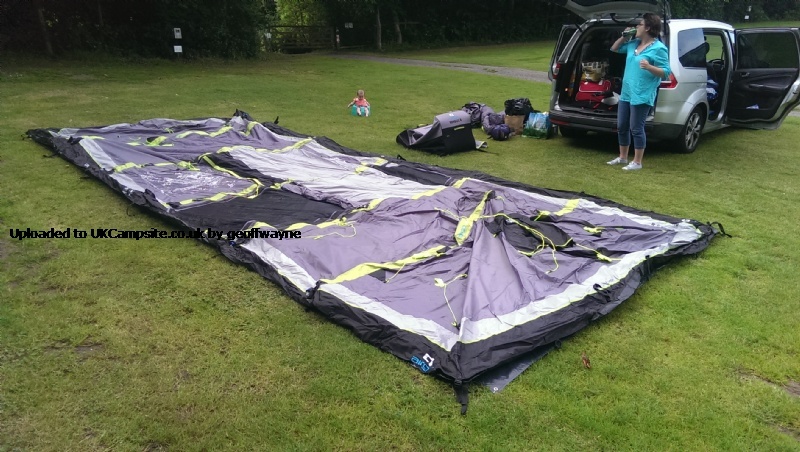 Porch groundsheet was missing in ours and there seems confusion as to its existence at Go Outdoors (it does!). 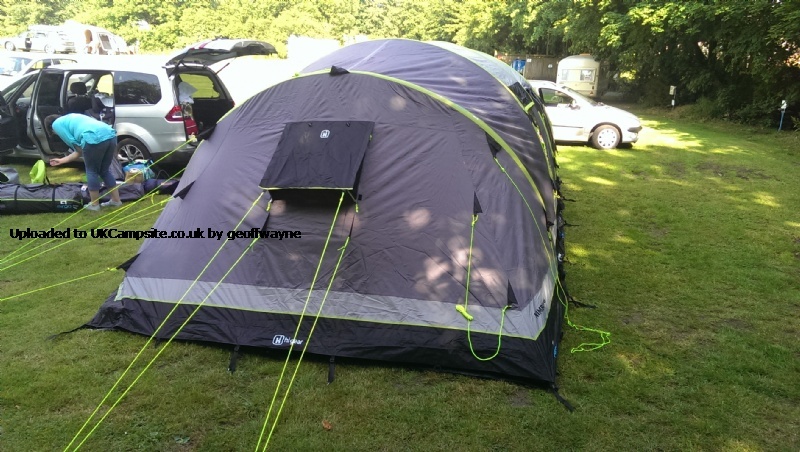 Would not go back to a pole tent now as this is so easy without having to play pole spaghetti. Tent stable and dry in windy and wet conditions on our first use. Bought this tent spring this year (2015) and have been away in it just once, the first camping trip ever. This tent is a lot of money but we wanted the convenience of not having any poles. 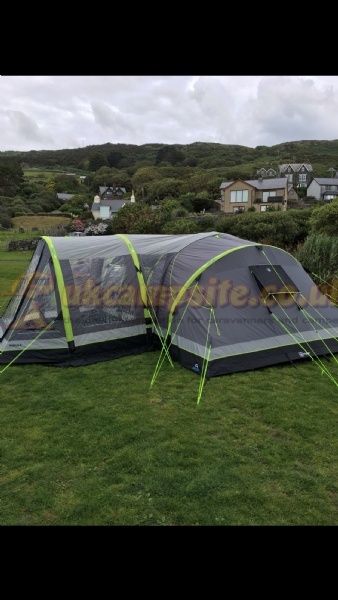 This tent seems to be at different prices in Go outdoors from month to month. We paid �1000 with the foot print, carpet and porch. It would be �1350 if bought separately. Go outdoors were doing it for �1200 as a package. I simply asked for a better deal and without Any pauses the manager went down to �1000. So never pay more than that guys! The porch bag is big, the tent bag is enormous! They took up our entire Astra hatchback boot. The good thing is, there is loads of spare room in the tent bag for other stuff. At first we thought this was because no one could put it back in the bag as small as the manufacture but no, it easily folds back much smaller than the bag. This then allows you to put the footprint and carpet in and we also put an extra large ground sheet for picnics and all our air beds in it with still a little room to spare. Be aware, however it is very heavy, tent is 45 kg plus all the other bits. The handles on the tent bag did hold out with all this in but care needs to be taken. Wheels are on one end which does make things easier. The Footprint is a great idea as it allowed us to center the pitch of the tent in the allocated area and keeps the bottom of the tent dry and mud free. 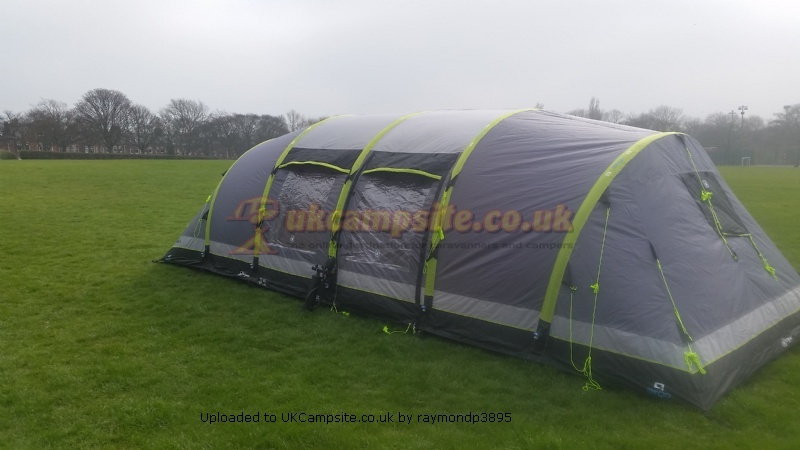 This tent does inflate very quickly however someone suggested on here to put some lagging around the handles of the pump, this was a great idea as it could make your hands a bit sore. Where they get 80 seconds from I do not know, I'm a fit 41 year old man and it still took about 3 mins or so. Anyway, it's not that part that takes the time, it's all the guy ropes to peg out that does. The porch is great to leave your shoes in and we also left the gas stove on a kitchen table in it until we cooked and just dragged it outside. The porch ground sheet is a bit of a strange one. There are three holes in the porch ground sheet, nearest the tent door opening and it looks as though the tent air beams should fit in them but they can't as there is no hole in the tent ground sheet. What I did was to peg the main tent tension cords through these holes and pull the gaitor cords tightly around them, these would otherwise be loose because of the porch on the front. Well it worked anyway. This tent is spacious as it's an 8 person one. We only have two kids, so with them in one of the four double rooms and us in another, we had a room for the food storage in one and another for the tent bag, pump and clothes bags etc. We had lots of rain on our last night with nothing wet in the morning. All in all I think a great tent, looked the smartest one on the campsite! Purchased this tent to return to camping after 30 years. We chose an air tent for the speed of putting it up and down. We have now completed our second use of it, and in essence am very pleased with the results. With having a bad back, we used an electric pump (from an air bed) to get the initial air into it, but it does pump up quicker with the pump supplied, and we must need a little more practice to pump it up in the 80 secs it states, but it doesn't take much more than this. The canopy took a little working out how best to fit, and although through trial and error it fit snug to the tent. One of our nights it was quite windy, and there was a torrential downpour, but the tent is well anchored down and was fully waterproof, we were very comfortable inside, and the canopy also withstood this 'battering' with no problems. When dismantling it comes down very quickly, and we found that rolling it tightly one way with the air vents open, then unrolling and rolling it the other way, it removes all the air and fits very easily back into the bag. Purchase this tent recently and just had our first weekend away in it. We pegged it out then my husband and son pumped it up (requires a little more effort than expected, but nothing too difficult) from the first pump to the opportunity to be able to get inside and start unloading was a total of 3 minutes! 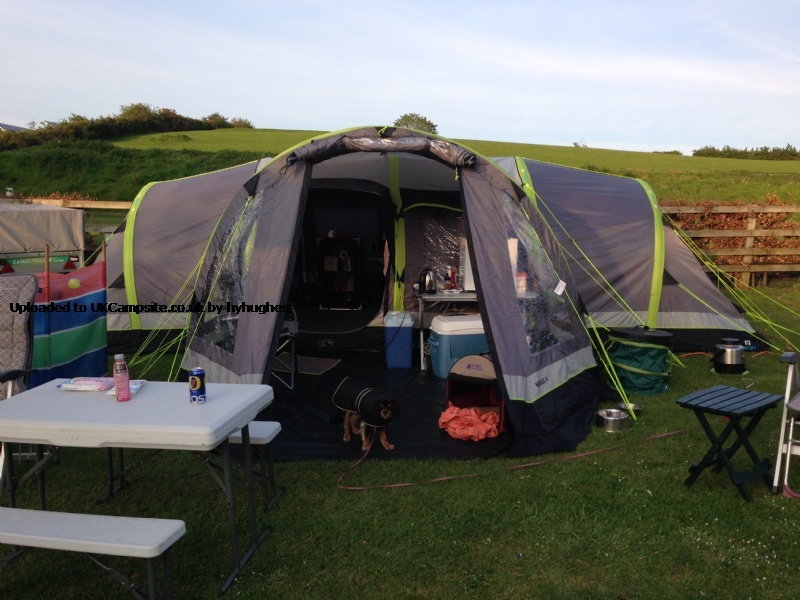 We purchased the full package, the footprint was great and kept the underside of the tent clean. The carpet was lovely and soft, I would of missed this if we hadn't of purchased it and the extension was a real plus, although not so easy to attach, but for our first time it worked fine and im sure with practice it will fit snug. We had no wind or rain so unable to comment as to how well it would stand up, but im confident it would not be a problem. The bed pods were already fixed, we were a family of 4 and we each have a single inflatable bed, the large high ones. These fitted in very well and still gave us ample room. There was good ventilation and storage pockets. On the negative side and they are minor, the door is low and we all had to duck to enter but once inside the height was not a problem, only one entrance for the electric cable, other than that it was perfect for a weekend away. We also own a Kampa Studland 8 Classic a mega big poly cotton tent which takes forever to put up, but when we travel abroad we will take the Studland as we could feel the difference between a polycotton tent and the Airgo but the Airgo is ideal for short breaks and we would thoroughly recommend it. 1 from 3 people found this review helpful, was it helpful to you? Add your review of the Airgo Nimbus 8! 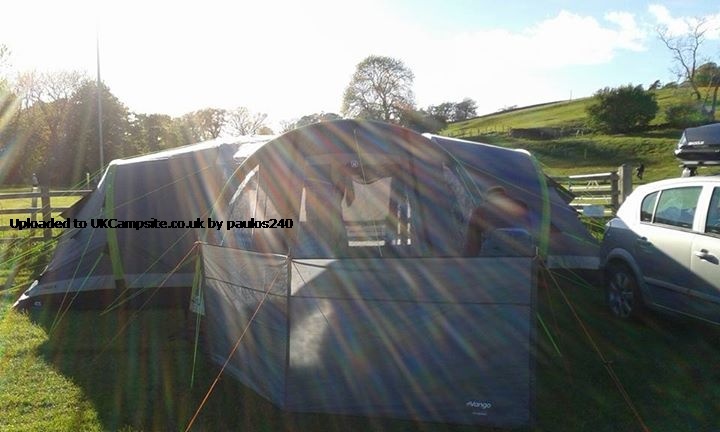 A giant luxury inflatable tent that pitches in minutes, designed for extended camping holidays with family and friends. Part of the Hi Gear AirGO range, it takes the hassle out of setting up your tent. Built using highly robust double skinned beams that are simply filled with air using an included stirrup pump, it provides a rigid pole-free frame in minutes. 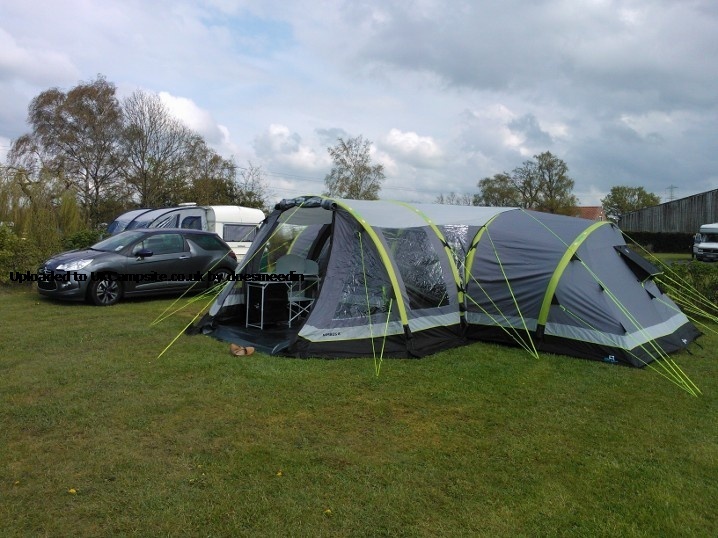 Unlike other inflatable tents on the market, Hi Gear AirGo tents have a single inflation point (all beams are interconnected) so setting up is very quick and easy. Its versatile bedroom set lets you choose a variety of sleeping options, and bedrooms can be removed to give you extra living space. The bedrooms are made using breathable fabric with mesh venting for extra ventilation, with multiple central tent tidy pockets for simple storage. The side door can be extended (using the included poles) to form a small canopy for extra shelter from the rain, or extra ventilation i the sun. The Nimbus 8's superb build quality and extremely waterproof flysheet (6000HH rated), with strong guying points and multiple guy lines, ensure that it will stay stable and in one piece even in harsh weather conditions.